Friday's arrival of the long-awaited RZA martial arts flick The Man With the Iron Fists is in some ways the culmination of a 40-plus-year love affair between black America and kung fu mythology. (As RZA told The Root recently, the fact that he has co-written, directed and starred in his own karate film is the realization of a dream.) From traditional African fighting styles and black comic book superheroes to blaxploitation-era schlock and big-budget Hollywood fare, the connections are numerous. Here are 20 chambers to get you ready for today's main event. As with any good piece of black pop culture, the lore around African-American physical science is incomplete without a look backward in time to the "authentically black." From the ginga of capoeira to Nuba wrestling to the dambe system of West Africa's Hausa, the Afro-Atlantic has spawned dozens of highly effective striking and grappling styles, each of which carries the trace of either slave-pit crucibles or days of martial honor gone by. Listed among the Black Panther Party's many community programs — Home SAFE Visits; the Intercommunal Youth Institute; a junior and high school tutorial program; legal aid; liberation schools — is martial arts. Overall, no self-respecting revolutionary movement was complete without some or another practice of uplift through martial discipline. The immersion in Asian styles is a kinetic corollary to the proposition that no Vietcong had ever called anyone n—ger. As film producer Warrington Hudlin recalled for SFGate's Jeff Yang on the occasion of Jaden Smith's Karate Kid remake, "The Black Panther Party, Ron Karenga's Kawaida movement, the Nation of Islam — all of those groups were heavily invested in martial arts." One of the major gripes about the first true black superhero since his 1966 introduction is that he has no, like, superpowers. This is a shortsighted complaint. Chief among the king of Wakanda's abilities is the fact that he is "master of all martial arts, including African and unknown forms." A trinity of transcendental signifiers if ever there were any, the Black Panther's ability set — superhuman hearing, superhuman strength and agility, and mastery of all fighting styles and weapons — is such that even unaided and unadorned, he embodies humanity at its peak. Actor, martial artist, tennis pro — Jim Kelly is the consummate Renaissance man. The initial claim to fame of this master of multiple styles of Okinawan kara-tay: a role opposite Bruce Lee in 1973's Enter the Dragon. (His character, Williams, does not survive his trip to Han Island but earned cool points for being on the run, Sweetback-style, and refusing to narc on soul brother Lee.) Dragon brought Kelly eternal fame and a three-picture Warner Bros. deal whose high-water mark was 1974's Three the Hard Way — although Black Belt Jones (1974) and Hot Potato (1976) weren't bad. The holder of 12 black belts, Ron Van Clief, aka the Black Dragon, may be the only person on this list with a legitimate, non-entertainment-based martial arts career. With more than 40 years of active competition, he claims five world karate-kung fu championships and 15 "All American" titles. During the heyday of kung fu and blaxploitation, Van Clief made a number of legit, fight-focused films — including Black Dragon (1974), The Black Dragon's Revenge (1975) and Bamboo Trap (1975) — and he fought his last professional bout in 2002 at the age of 60. He was also fight coordinator on The Last Dragon. Although Tamara Dobson would spend her career in Pam Grier's shadow, she rates her own entry on a martial arts-themed list with the 1973 flick. Standing 6 feet 2, Dobson was an exquisite subject for fight photography, with long legs that allowed her to turn a platform boot into its own unique deadly weapon. Given their shared residence in the ghettos of the American distribution and screening biz, it makes perfect sense that the blaxploitation flick and the kung fu flick would essentially converge in the mid-1970s. Few non-horror blaxploitation works were complete without a hand-to-hand training or combat scene, with flicks as diverse as Super Fly (1972) and The Spook Who Sat by the Door (1973) throwing in moments of GI-clad fisticuffs with no real purpose beyond alerting us that our hero is really, really, one bad mother. The apotheosis of this pastiche is likely Rudy Ray Moore's Dolemite-franchise spin-off movie The Human Tornado (1976), which rips off martial arts tropes willy-nilly and spits them out in a whirlwind of in jokes and coded references, creating its own wobbly genre in the process. Bruce Lee's "last" film, cobbled together in 1978 after his death, is an inadvertent masterpiece, in large part thanks to a penultimate fight with (sort of) Kareem Abdul-Jabbar. The scene purporting to be between a yellow-tracksuit-clad Lee and his occasional Jeet Kune Do student Abdul-Jabbar is really a mashup of file footage, shots from an earlier version of Death and reshot elements using stand-ins for both men. But even with all that going against it, the scene still manages to pack the proverbial punch, and Abdul-Jabbar and his various avatars claim for themselves a legibly black style of fighting. The basketball great is, in turn, clearly accorded a level of respect by the greatest fighter ever. The image of Lee with a giant Abdul-Jabbar footprint on his chest is simply one of the key iconic moments of action cinema. If Prince and Michael Jackson are the mid-1980s' giant binary star system of black-male otherness, Bruce Leroy is definitely their minor, orbital satellite. Beloved by socially awkward — but stalwart — nerds everywhere, the account of the naïf on a mystical journey, played by Taimak Guarriello in the 1985 musical hit, was the perfect ugly duckling story for its era. The Last Dragon promised put-upon losers everywhere that they could get not only the girl but also the glow, as long as they stayed in school, studied hard, kept their eyes on the prize and so on. In the process, two distinct forms of wish-fulfilling mumbo jumbo come together: martial arts and Cosby Show positivity. By 1988, the black martial artist had become a figure of parody. The Kung Fu Joe character in I'm Gonna Git You Sucka was a walking, talking cliché machine, right down to the beat-box-like production of his own sound effects. Ironically, the actor who played Joe — the late Steve James — was a martial arts player in good standing, appearing in a number of Hong Kong flicks and having a major role in the American Ninja series. Befitting the then-dawning era of ironic Internet fame, the greatest black martial artist of the mid-1990s may just have been infomercial pitchman Billy Blanks. After appearing in a string of forgettable action flicks — despite a successful run as a martial arts competitor — Blanks became an international sensation thanks to a massive infomercial air attack for his signature Tae Bo exercise system. Before he was best known as a tax criminal, Wesley Snipes was one our finest actors. Credible as both a dramatic and an action lead, Snipes has a versatility (and personal lore) that has been fueled in large part by a lifelong study of martial arts that earned him two black belts, one in Shotokan karate and another in Hapkido. Snipes' string of action work — Passenger 57, Demolition Man, Money Train, The Fan, U.S. Marshals and Rising Sun — would culminate with the Blade franchise, essentially a samurai flick in vampire drag. In a sentence, nothing to f—k with. 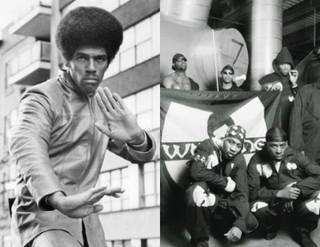 After a decade of moribund, parodic reference making, Wu-Tang Clan's rigorous, deep-structure love affair with the kung fu genre was a live wire that not only rejuvenated hip-hop but made everything from Ghost Dog to The Man With the Iron Fists possible. Actor Michael Jai White holds seven black belts and has long hovered at the cusp of action stardom. After breaking through as the title character in a big-picture version of Spawn from 1997, he had roles in a number of fight-centric flicks, including Universal Soldier, Exit Wounds and Silver Hawk, the last one with Michelle Yeoh. White starred and wrote the blaxploitation parody Black Dynamite (2009), which includes copious, thoughtful head nods (or is that head butts?) to the melding of blaxploitation and martial arts. Unfortunately, White has had some recent success as a romantic lead, raising the specter of his skills withering on a velvet vine of cushy gigs in lucrative — but soul-killing — Tyler Perry flicks. The era of YouTube and mixed martial arts has produced a semisecret lore around possibly nonexistent prison-house fighting styles. Going by names of largely neighborhood extraction — Brick City Rock, Comstock Style, Stato, Jailhouse Rock, 52 Hand Blocks — these supposed new fighting styles are full of characters best known to friends, family and midmarket radio. It remains a question of debate whether any of these are complete systems — the conventional wisdom pooh-poohs them as mashups of existing close-quarters fighting styles. But the YouTube videos are, in a word, awesome. Before there was The Man With the Iron Fists, there was 1999's RZA-scored Ghost Dog: The Way of the Samurai. An almost anti-kinetic meditation on honor, loyalty and point of view from Jim Jarmusch, it has a lead performance by Forest Whitaker that's like a Zen koan: mysterious, concise, endlessly rewatchable. Although it's The Matrix's Neo who gets to utter the words "I know kung fu!" it is Morpheus, the character played by Laurence Fishburne, who most fully embodies the martial spirit. Morpheus simultaneously occupies an entire spectrum of kung fu archetypes: He is teacher, he is loyal companion and he is also doomed samurai throwing himself into a battle he can't win. Although the series ultimately uses a bit of deus ex machina (literally) to save Morpheus from certain doom, Fishburne throws himself into his character with an impressive brio. The bulk of images of black martial arts are of African Americans looking East, but the manga-and-anime series Afro Samurai looks the other way, from Asia to America. Lead writer Takashi Okazaki was born in 1974, and by the time he was a teenager, hip-hop and martial arts were co-equals on the cultural landscape, creating a hall of mirrors where an Asian cultural producer is essentially quoting African-American artists quoting Asian artists. Needless to say, only Samuel L. Jackson could voice the end result. There are few directors better equipped to shoot a kung fu flick than the Hughes brothers, which is why their postapocalyptic morality play, Book of Eli, from 2010, has the feel of a samurai classic. Denzel Washington, as the eponymous lead, channels the iconic blind swordsman Zatoichi; Eli's mission is not so much to save the world as help ensure the content of its character. Washington's physicality and Eli's plan of action (bursts of violence interspersed with zones of parched waiting) are such that we don't wonder how a then-56-year-old could accomplish his feats of derring-do. The difference between the Jackie Chan-Jaden Smith remake of the iconic tale of a martial arts underdog is the difference between 2010 and 1984. China's ascendancy relocates the story from the Los Angeles district of Reseda to Beijing, and the globalization of the entertainment industry replaces Pat Morita with a transnational movie star (Chan) and a Hollywood prince in waiting (Smith). The remade film is a much more credible martial arts set piece — Chan and Smith just have better skills than Morita and Ralph Macchio. While young Jaden's kung fu is strong, though, his acting is, unfortunately, weak. Perhaps they should have cast Willow?